Do You Have World Cup Fever? Sonoma Valley Sun is a weekly newspaper serving the city of Sonoma and surrounding communities with fresh and unbiased news reporting, smart graphics, and fresh photography. The Sun is a total market coverage product with its finger firmly on the pulse of the town it serves, allowing its readership to stay tuned in to the issues of the day. 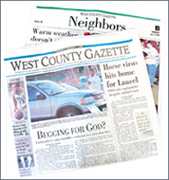 West County Gazette is a local community newspaper delivered on Thursdays in western Anne Arundel County, MD. It is the only newspaper published exclusively for the residents of Odenton, Gambrills, Piney Orchard, Seven Oaks, Russett, Four Seasons, and Maryland City. For more than 100 years, Advertising Red Books has been the industry's leading source for information about advertisers and advertising agencies. The Advertisers Database contains nearly 18,000 advertisers who spend at least $200,000 on advertising annually. The Agency Database contains detailed profiles of almost 14,000 advertising agencies. Verified now offers clients unlimited access to this valuable information for prospecting and other business purposes. Publications can receive data about advertisers and/or agencies by geographic area, company type, company name, advertising expenditures, brand, specialties and other search criteria. You receive a full report including company profile and contact information for all key personnel. To use this new service, contact your Account Coordinator at Verified. Tell them what information you would like and the search criteria you would like to use. You will receive information electronically in a Microsoft Excel spreadsheet. You can use the information in any way and keep it as long as you like. You are unlimited in the number of searches you can request per year. The only restriction is that the information cannot be sold to a third party. For more information on Advertising Red Books and the valuable information they provide, go to www.redbooks.com. If you have any questions, please call Verified at 415-460-6006. Media agencies and leading analysts expect the soccer World Cup, which runs from June 9 to July 9 in Germany, will take in $1 billion in advertising revenue in over 50 countries across all media. Fifteen major global brands including Adidas, Coca-Cola, MasterCard and McDonald's all have ads referencing the World Cup. Despite the huge ad spending worldwide, most U.S. ad agencies make claims like "the event had 'very little importance' or was 'not important.'" The one exception is the American Hispanic market. In that market, agencies categorized the World Cup as "extremely important." According to TNS Media Intelligence, a provider of advertising and marketing information, during the first 11 months of 2005, Spanish-language TV networks experienced the most advertising growth. However, over the same period, print media also experienced ad-spending increases ranging from 10.5% for magazines to 1.6% for newspapers. This year, the U.S. team was ranked fifth overall by FIFA going into the World Cup. Soccer is gaining popularity in the U.S., but the country's fan base remains small compared to sports such as football and baseball. Data isn't the same as information. You can tell potential advertisers that your readership is 10,000, the average household income is $75,000, and your CPM is $12, but unless you put that data into context, you won't be able turn it into information that your advertisers can understand and act upon. Your goal is to bridge the gap between data and understanding. What do I need to tell my clients to persuade them to buy advertising in my publication? What data can be turned into persuasive information? Each client is motivated by a different piece of data. Don't use every statistic from the media kit every time. Try to determine what exactly about your publication interests the potential advertiser. Is it the CPM or the market penetration? Leave the rest in reserve. Context can either play down a point or illustrate it. Comparing apples to apples can showcase your publication's strengths. Comparing your CPM to your competitors can be a very effective sales tool for your publication if it highlights the value of your readership. Information only sells when it meets the needs of your client. Hard data should only be part of the story. For example, your publication reaches 10,000 readers, and 75% fall into your advertiser's target demographic. Your competitor also reaches 10,000 readers, but only 40% of their readers fall into the advertiser's target demographic. Be armed with your publication's data, but present it as information. Using data effectively can increase sales and add to your publication's bottom line. HomeStretch Media recently successfully launched BandAds� with the Los Angeles Times and Disneyland. BandAds are advertisements imprinted on colorful rubber band bracelets that are wrapped around home-delivered newspapers. Disneyland used 300,000 lime green BandAds around the Los Angeles Times to promote the theme park's 50th anniversary and the reopening of Space Mountain. "The day the Disneyland BandAds were wrapped around the LA Times, people of all ages were seen wearing the bands on their wrists all over Southern California, especially the younger demographic," says HomeStretch Media President and CEO Eric Corwin. "With so much attention currently focused on high-tech advertising, BandAds is a simple low-tech item that stands out from the rest of the crowd and really connects with consumers." 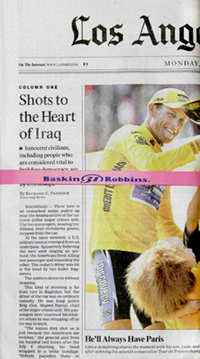 BandAds are akin to Lance Armstrong's popular "Live Strong" bracelet. According to HomeStretch Media, they come in a wide range of colors and start at $25 cpm. In addition to advertising, bracelets can be used as free collectibles or coupons and are eco-friendly and biodegradable. Newspapers and rubber bands go back to 1923 when Mr. William H. Spencer started Alliance Rubber using rejected Goodyear inner tubes he cut into rubber bands in his basement. After seeing the Akron Beacon Journal blowing across lawns, Spencer persuaded newspapers managers to try his bands. HomeStretch Media recently reached agreements with the San Francisco Chronicle, Sacramento Bee and LANG (Los Angeles Newspaper Group). Others using BandAds are the Gannett Company's top 25 newspapers (excluding USA Today), Boston Globe, and Lebanon Daily News (Pennsylvania). All publications audited by Verified report other non-qualified copies on their Quarterly Printing and Distribution Report (QPD). In the normal course of business, some number of copies do not ultimately end up in the hands of readers. For example copies uses by sales and office staff, tear sheets, and samples. These are properly classified as non-qualified. Any copies that do not meet Verified's definitions of qualified paid or free circulation are considered non-qualified. Tracking non-qualified distribution is a requirement of your audit. It helps you to reduce costs and waste by only printing what you need. Paying attention to non-qualified copies helps you maximize your printing investment. Copies used exclusively for business are non-qualified. Office use copies include tearsheets, sales copies, staff copies, archives, back issues, etc. If the copies for office use are included on a Carrier route, or are included in a Target delivery route list, please be sure to subtract these copies from the totals reported on your QPD. Special event distribution is non-qualified. Copies used for trade shows, street fairs or for promotional events are all non-qualified. This special distribution can be footnoted on the Audit Report and Publisher's Statement. Extra copies received from the printer (overruns) are normally considered non-qualified. Publications must account for all copies received from the printer whether or not they are distributed. Be sure that the total printed reported on the QPD includes any overruns received from the printer. If the overrun copies are regularly distributed, they can be reported as qualified. Verified's online reporting Wizard software automatically calculates the non-qualified total for each issue, and will not allow you to submit the QPD with a zero or a negative amount in non-qualified. Please make sure the total printed and all data reported to Verified are accurate.